Quail tend to come in yellow brown colours but can also come in white, white-black, speckled red-brown or cream-brown. Although a native of Japan, the first quails became popular in England as game birds but now are bred commercially for their lovely eggs. 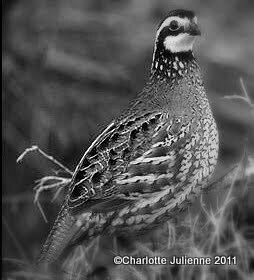 Quail like to live on the ground and will forage for any edible food they can find. The Japanese Quail (Coturnix Japonica) originates from Eastern Asia. The wild quails are naturally migratory birds living in grassland and cultivated fields. They are small and you have to work with some surgical precision to get the meat of the bone but the reward is a rich yet non gamey morsel. Like many game birds, the quail has little fat so we need to add a little. In a hot pan cook some bacon to render the fat, then add a little olive oil. sear the birds in this same pan then finish in a hot oven (375f). Once the flesh feels firm and the quail have a nice golden color, add some cubes of cold butter and baste the birds for a couple of minutes. Remove the bacon and rest the birds for 10-15 minutes. Reduce some Quail stock (or chicken) with some shallots, juniper and bay leaf. As it is winter, we braised some Yorkshire Cabbage with a little bacon and white wine. We also roasted some potatoes and parsnips. We then served the bird whole on the cabbage with a little of the stock reduction and the crispy bacon on top.